You are here: Home / What Is The Difference Between A Quilt And A Blanket? During the cold Winter months when the chill creeps in, there’s nothing better than wrapping up in something cozy to keep you nice and warm. Whether it’s an afghan, a throw, a blanket or a quilt, everyone has a few sitting around to warm up cold fingers and toes. Though some people may use the words interchangeably, a quilt and a blanket describe two different types of textiles. In this article, we’ll examine the difference between the two. An integral part of many world cultures, quilts are as much a form of artistic expression as they are a useful object. Though not all are made with great artistic meaning, the delicate and extensive stitching required to make even the most basic quilts is an undertaking that nobody can overlook. 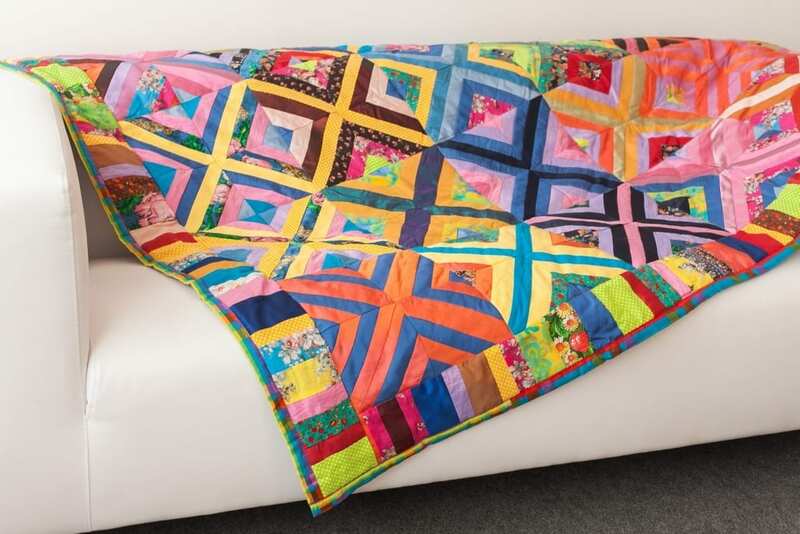 Though quilts are sometimes designed as blankets, they are also used as wall hangings, displayed over furniture and used as table runners or decorative objects. 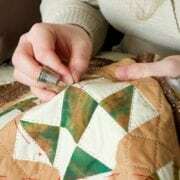 The distinctive aspect of quilting is the use of patchwork, in which fabrics are sewn together in a geometric pattern that is aesthetically pleasing. 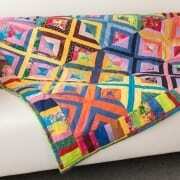 It can include several subcategories of patchwork. When patchwork is completed, the quilting procedure takes place. It involves connecting three layers through the use of a running stitch in a pattern throughout the project. It can be done alone or in a group, by hand or by machine. In some cultures, quilting circles are considered an important ritual, and in others, they are just a popular hobby. Many cultures across the globe regard the creation and gifting of a quilt as a way to tell a story, commemorate a milestone or note an important place, event or person. The Amish use quilting as a way to reflect their rejection of modern conventions and utilities. These have become some of America’s best-known quilts, as the Amish have created a cottage industry through the creation of these textiles. Regionally popular, Baltimore quilts originated in the 1840s in the city after which they were named. They involved the use of a more detailed and fanciful applique style, and some quilters seek a resurgence in this style. Quirky scrap quilts called ‘crazy quilts’ in the community look like a modern fad but were popularized in the 1800s. Rather than using a geometric design, these quilts use random shapes to use up scraps and create the eponymous ‘crazy’ pattern. African American quilting came to North America from Central and West Africa. Traditionally, these beautiful quilts were used to tell stories and preserve the legacy of the people who created it. The 1980s saw a resurgence in interest in both this intricate style and the historical works which contain it. Pictoral quilting became popular in the US as well as Ireland and England in the late 1700s. The style involved using appliques to create a picture. At times, these were made with multiple pictorial patches created by several people within a community. Native American star quilts tell an important spiritual story of the native women that create them. These art forms were many times created as a response to the struggle to adjust to reservation life. They are still made today, with some native women relying on the sale of the quilts for a source of income. As you can see, while blankets might be a simple and straightforward functional item, quilting is a crafting tradition with a very rich history. Whether they’re hanging in a museum or draped over your bed, both textiles will undoubtedly put their differences aside and continue to be loved worldwide. At The Inspired Sewist, we have all you need to start exploring the blankets/Quilt world, visit our site to read more about this topic and have a look at our products which are ideal for your sewing path.